If you place your right hand over the area under the ribs on the right side of your body it will just about cover the area of your liver. It is divided into two main parts (left and right lobes). Each of these lobes is further divided into segments. Additionally, the liver has an amazing ability to repair and regenerate itself following surgery and will re-grow to its original size in about three months. When a diagnosis of bowel cancer in made, patients undergo a series of tests (see below) to see if the cancer has spread. A diagnosis of secondary bowel cancer in the liver can happen when you are initially told you have bowel cancer or some time after the initial diagnosis, during routine follow up. Blood tests Blood test samples ('liver function tests') can be taken to see how well your liver is working and can be used to monitor patients for the early detection of secondary cancer. By detecting secondary cancer early, the treatment options can be greater and more successful. Liver biopsy Your doctors may decide to take a small sample of tissue from your liver (a 'biopsy') to look at under the microscope. This procedure involves a very fine needle being passed into your liver, using a CT or ultrasound scan for guidance, and generally involves an overnight stay in hospital (due to the risk of bleeding associated with the procedure). You will receive a local anaesthetic to prevent pain. MRI scan Magnetic resonance imaging (MRI) uses magnetic and radio waves (not X-rays) to show the tumour(s) in great detail and look at the blood supply to the liver. During the scan you will have to lie in the scanner for up to an hour, and, whilst it is very noisy, it is painless. Let the doctors know in advance if you are claustrophobic. You may be asked to drink a liquid 'contrast medium' before a CT or MRI scan, or be given an injection of a contrast medium during the scan (which may give you a hot flush for a few minutes). The dye travels to your liver to help produce a better image. Ultrasound This painless test, which takes about 10 minutes, uses sound waves to build a picture of the inside of your liver and its blood supply. Sound waves from the scanner pressed onto your abdomen bounce off the internal organs, and echo back to make pictures on a computer screen. It may be possible to remove the affected part of the liver with surgery and this is known as a 'liver resection'. If, following review of your scans and your clinical condition, the members of the Liver Multi-Disciplinary Team (MDT) agree that surgery is an option, this will be discussed with you. If surgery is not an option, the reasons for this will also be explained to you by your specialist. If the scans do not make it easy to see if you would benefit for liver surgery, the liver surgeon may choose to carry out a laparoscopy. This is a keyhole investigation which will allow the surgeon to 'look around' before deciding on the best course of action. If surgery is an option, this is the best chance for long-term survival. Increased knowledge of the different segments of the liver has led to the development of segmental-based surgery. 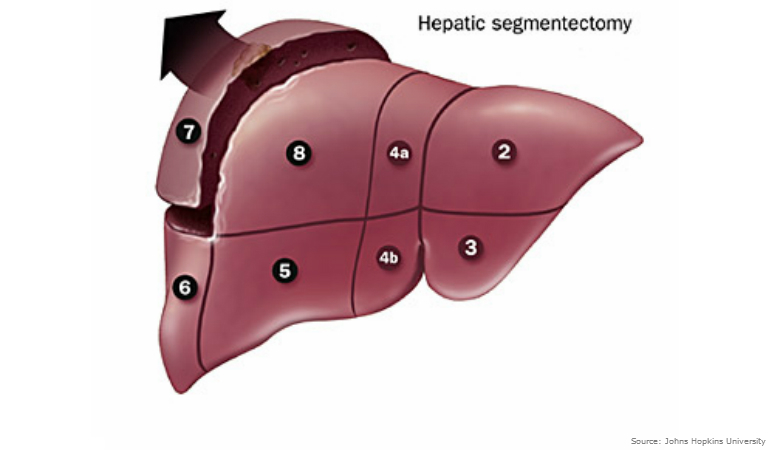 The liver can be divided into 8 segments: segment 1 is the caudate lobe, segments 2 through 4 form the anatomic left lobe and segments 5–8 form the anatomic right lobe. 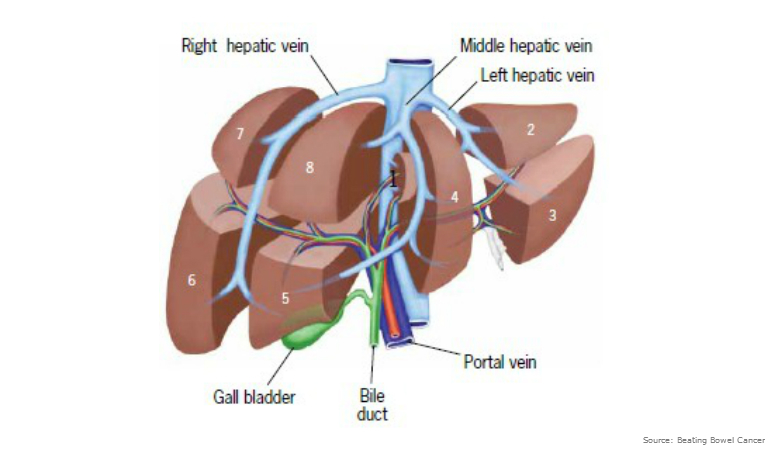 Segmental anatomy of the liver is based on the direction of the hepatic veins in relation to the intra hepatic distribution of blood through the portal vein. It is possible to resect up to 6 segments out of 8 in one stage, but usually one lobe or part of it is removed in a typical surgery. Lesions confined to the right lobe are amenable to en bloc removal (removal in one piece) with a right hepatectomy (liver resection) surgery. Smaller lesions of the central or left liver lobe may sometimes be resected in anatomic 'segments'. 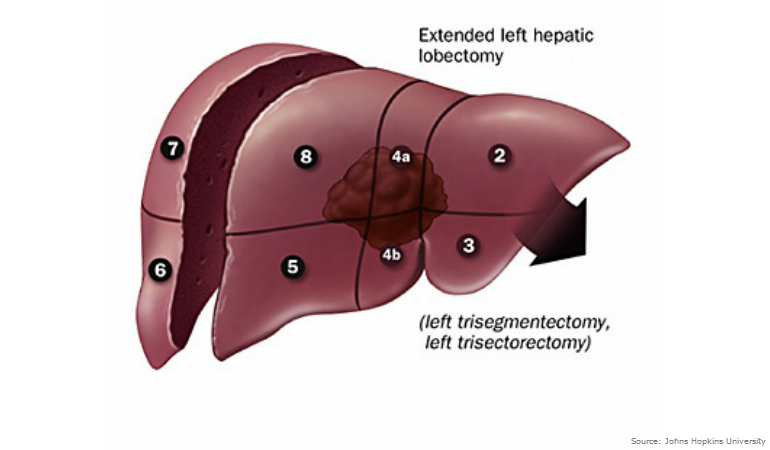 Large lesions of the left hepatic lobe are resected by a procedure called hepatic trisegmentectomy (see diagram and explanation below). When lesions are located peripherally (on the edges of the liver), hepatic wedge resection or anatomic segmentectomy are performed. If a tumor is adjacent to or involving major intra hepatic vessels, resection of the entire segment or lobe is necessary. Lobectomy is indicated when multiple lesions are located in different areas of one lobe. Wedge resection is universally accepted for small superficial lesions. Liver resections are usually performed during 'open' surgery through an incision in your abdomen, however increasingly liver tumours are being removed by 'keyhole' (laparoscopic) surgery. Unfortunately laparoscopic surgery is not suitable for all patients for a number of reasons including the size and/or number of tumours to be removed, which makes the operation more complex. Additionally, there are times when laparoscopic surgery is started but surgeons need to revert to open surgery during the operation. Liver resections usually take between 3-7 hours. If you are suitable for an operation, your surgeon will explain to you that there are risks associated with liver surgery. These risks vary depending on the type of surgery you are having, the number and location of your tumours, your liver function and your general health. If you do experience complications following surgery, you may have a prolonged stay in hospital including additional time in the Intensive Care Unit (ICU). Your surgeon will fully discuss your risks with you prior to the operation. There are only four surgical units that lend themselves to controlled excision and they include lobectomy (right and left), trisegmentectomy (right and left), segmentectomy, and wedge resection as illustrated below. 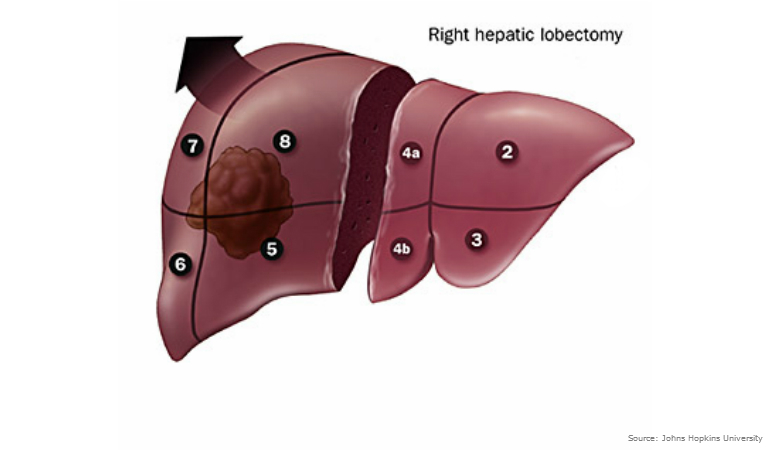 Right hepatic lobectomy - right lobe which consists of two segments. 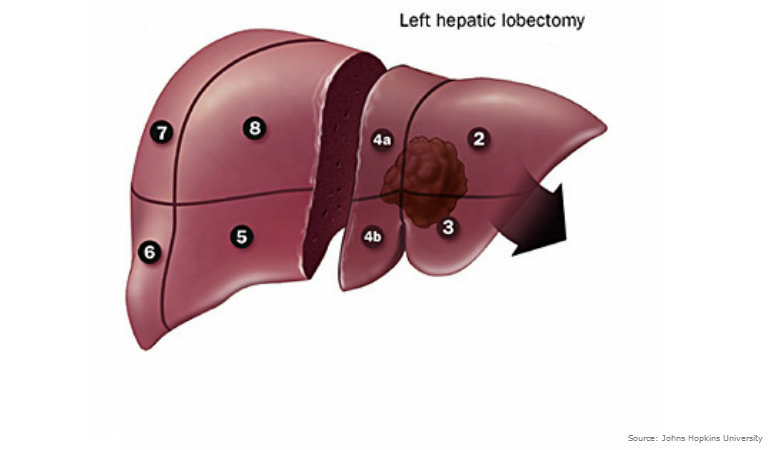 Left hepatic lobectomy - left lobe which consists of two segments. Left trisegmentectomy (also known as extended left hepatic lobectomy) - removal of the complete left lobe plus the medial segment of the right lobe. 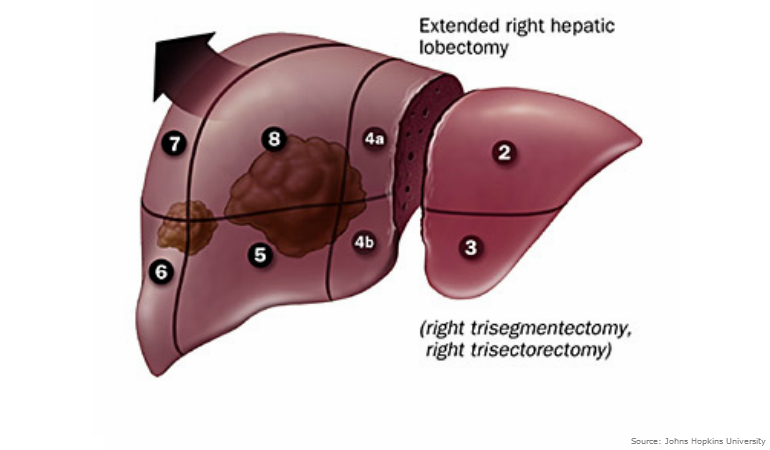 Right trisegmentectomy (also known as extended right hepatic lobectomy) - removal of the complete right lobe plus the medial segment of the left lobe. Lateral segmentectomy - liver to the left of the falciform ligament (a ligament that attaches part of the liver to the diaphragm and the abdominal wall) in a single segment. 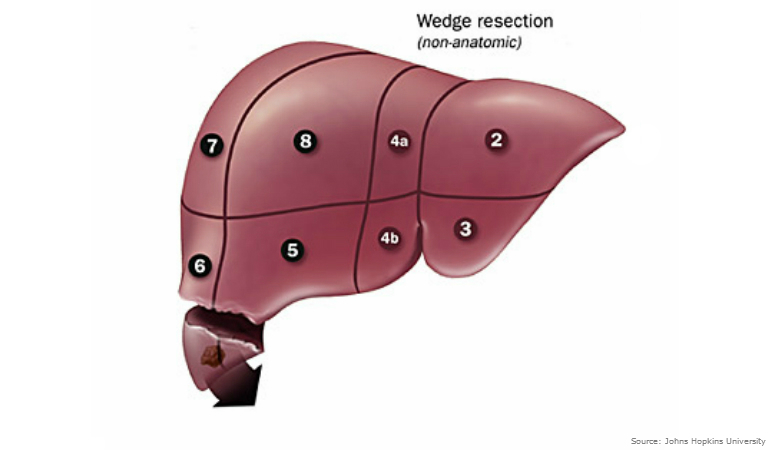 Wedge resection - small triangular-shaped portion of the liver whose tumour is situated on the surface and located peripherally (on the edges of the liver), so that it can be safely removed without injury to the blood vessels of the liver. The tumour with a small amount of normal tissue around it is removed. A liver operation is a major operation and you will normally be admitted to Intensive Care or a High Dependency Unit for a day or so following surgery. This allows you to be closely monitored in the immediate period following the operation. You normally stay in hospital following liver surgery for 7-10 days. Radio frequency ablative therapy is a technique of heating up and destroying liver cancer, with the overall aim of controlling tumour growth in the liver. Imaging techniques (e.g. ultrasound/CT) are used to guide a probe (needle) into the tumour, through which high frequency electrical currents are passed. This creates heat that destroys the cancer cells. 'Radio frequency' refers to the high frequency electrical currents. 'Ablation' means destroying. 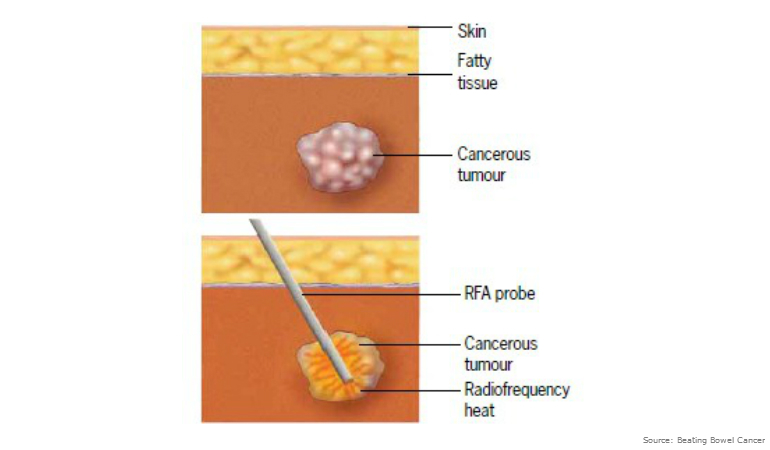 Research shows that RFA works best on tumours less than 3cm across, but it can be used on larger tumours. You can have RFA treatment more than once. The treatment is given under a general anaesthetic. The surgeon/radiologist uses the scan to guide the probe (1-2mm across) into the tumour. The heat can be varied depending on the size of the tumour, and the time taken to treat each tumour is usually about 10-15 minutes. Most people go into hospital the night before the procedure, and go home the day after. You will be given painkillers to take home and you will usually have another CT scan 6-8 weeks after the treatment to see how effective it was. Whilst chemotherapy is a common treatment for secondary cancer in the liver, chemotherapy alone is unlikely to provide a cure. If the liver tumour is too large to operate on, you may have chemotherapy to try and shrink the tumour so it can be removed. If the liver tumour is small, you may have chemotherapy before and after the surgery. Chemotherapy may be given to improve ability to undertake surgery, to reduce the number of tumour cells, or to slow their growth to provide symptom relief and extend survival. Increasingly, patients whose liver tumours cannot be safely removed following diagnosis but are fit for surgery can be treated aggressively with chemotherapy in order to 'shrink' the tumour. In this instance, you would receive chemotherapy for an initial three months prior to being re-scanned and reassessed for surgery. RAS testing is undertaken to test the likelihood of response to certain treatment. It is becoming more common for patients who are being considered for certain drugs (or prior to entry into a clinical trial) to have their RAS status checked. Tumours that are wild-type have been shown to be more responsive to certain treatments. Therefore, determining the RAS status of a tumour helps oncologists to choose the most effective treatment for each individual patient. Please visit Bowel Cancer Australia's RAS Biomarker Test webpage for further information. TACE is a treatment used to treat cancer that has spread or started in the liver. Chemotherapy is injected directly into the vessels in the liver that are surrounding the tumour. Because the chemotherapy is injected into the liver the side effects experienced are much fewer. 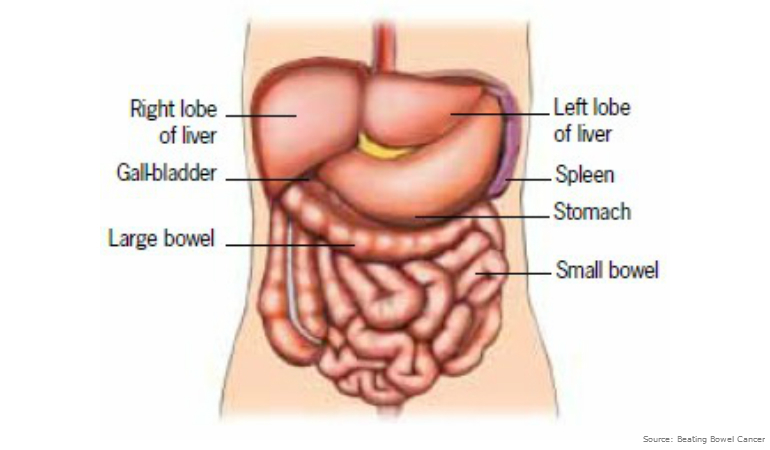 The liver receives its blood supply from two sources - the Hepatic Portal Vein and the Hepatic Portal Artery. Cancers in the liver receive their blood supply exclusively from the Hepatic Artery. When is the treatment undertaken? This treatment is usually undertaken when the liver disease is the predominant disease and surgery is not an option. It tends to be used when the tumours are too large for surgery or if there are many smaller tumours. It can be performed numerous times to the same area or many times to target different lobes of the liver. It is always important to ensure enough functional liver is left to compensate for the area of liver receiving the treatment. The size and position of the cancer in the liver will determine how much of your liver is treated. A catheter is introduced via the femoral artery in the groin and threaded directly into the hepatic artery of the liver. The chemotherapy is injected directly into the area of the liver that is being treated. The chemotherapy is mixed with an x-ray dye to allow the specialist to see where and how much chemotherapy is being delivered into the liver. Following the administration of the chemotherapy the tiny sterile sponges are injected through the catheter to temporarily close the artery. This will starve the tumour of a blood supply and prevent the chemotherapy moving away from the tumour and affecting other areas of the liver. The healthy part of the liver is still receiving its blood supply from Hepatic Portal Vein. After the procedure you will have pressure placed on your femoral artery in the groin to prevent bleeding and you will need to lie flat for around four hours. The side effects tend to be minimal but they may include mild nausea/vomiting and abdominal pain, sluggish bowels, low grade temperature and hiccups. Medications such as paracetamol (for pain and low grade temp) and Metraclopramide (for nausea/vomiting) may help with side effects. You will be required to stay overnight in hospital. What follow-up should is required? A follow up appointment with your treating specialist and a CT scan should be made between 6-10 weeks after your TACE treatment to assess how effective it has been. If there where multiple areas treated or a large tumour volume then additional TACE treatments may be required. SIRT (also called radioembolisation) is a targeted treatment, which can be given alone or in conjunction with 'down-staging' chemotherapy. The treatment involves millions of very tiny 'beads' (micro-spheres) being injected into the liver. Each bead, which is about one third the diameter of a human hair, is coated with a radioactive substance that gives out radiation specifically to the liver (concentrating mainly in the tumours) for about two weeks. While treating patients with SIRT is increasing, it is only suitable for patients who have liver tumours where either the liver is the only site of disease or the liver is the major site of disease. SIRT has no effect on tumours outside the liver. Before SIRT can be offered as a treatment option for patients, there are a number of other factors that have to be considered. Most importantly, you need to have a sufficiently healthy liver that is working satisfactorily. This is usually determined by a simple blood test. Patients receiving SIRT usually undergo two procedures. The first procedure is to prepare the liver for the treatment and involves a fine tube ('catheter') being inserted into a blood vessel in your groin area and passed up to the blood vessel taking blood to the liver. You would also receive a small amount of radioactive dye to check the blood flow between your liver and lungs, and vessels in your liver will be blocked to stop the micro-spheres traveling elsewhere in your body. The second procedure involves receiving the micro-spheres, also via the tube in your groin area. This is typically done 1-2 weeks after the initial test is completed. The treatment involves staying in hospital for between one and four days. In terms of side-effects, many patients have abdominal pain and/or nausea which will normally subside after a short time with or without medication. Patients can also develop a mild fever for up to a week, and fatigue for several weeks. Patients are usually given medications when they go home, such as pain-killers to prevent or minimise the side effects.  Please visit Bowel Cancer Australia's Selective Internal Radiation Therapy webpage for further information.